A new season is upon us and so are new, LOWER prices! Due to advancements in technology and increased volume, Slipp-Nott has been able to achieve economies of scale that allow us to pass incredible new savings on to you, our clients. These new prices allow more schools and individuals than ever before to purchase the same quality product the NBA, the NCAA and thousands of High Schools and middle schools have been using since 1987, the year we invented the “Traction Mat”. It occurs to us that some of our dealers and prospective clients may have concerns that Slipp-Nott may be losing “traction” to the competition. We are hoping to address any possible concerns with this post. Whether you are a Slipp-Nott dealer or a new customer thinking about buying into what seems like an attractive, new traction system, you’re about to find out that beauty really only is skin deep in most cases. Low priced product with even lower quality have begun showing up. Glancing at those products one might think that they are very similar to what we manufacture but upon close inspection anyone can see that these new products are simply cheap imitations. If you are a current dealer, you have already received a letter touching on the major points and the new price list. This blog post will be a more detailed treatment of the competition. 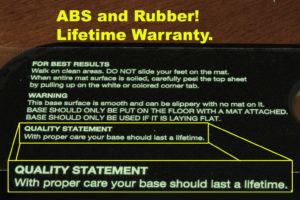 That’s right, we warranty our bases for life! Their warranty: If it is found to be defective within 90 days, they’ll replace it. 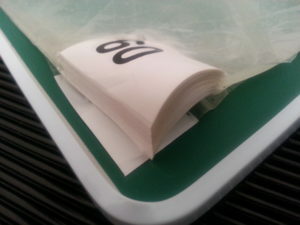 As one can see, a closer look reveals that their base is actually made of “foam sandwich” construction, like foamcor. 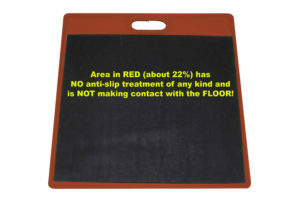 Our bases have a solid sheet of rubber that prevents slipping and properly weighs the base down. Their Base: just over 2 lbs! An adequately weighted and balanced base will not become a trip hazard when an athlete walks across it with clean sneakers. Our tests show that a base must weigh a minimum of 3.75 lbs. to stay safely planted in place. Their base weighs less than half of ours! What about cost? Their 60 sheet mats cost 41.65¢/sheet and at the new lower MSRP of $20.50, our 50 sheet mat costs 41¢/sheet! 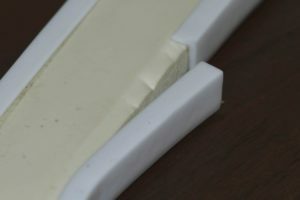 Our solid rubber bottom keeps the base weighted and also makes contact at the all important edges to make sure the base doesn’t slide around. 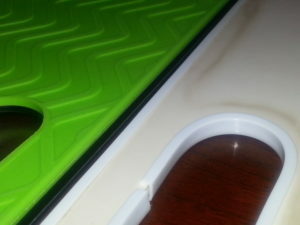 Their little foam sandwich uses a 1/16″ thick, foam rubber sheet to try to keep in on the floor. 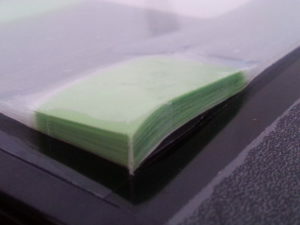 Not only does it not cover the whole bottom surface, it is also extremely light! • The 50 sheet Slipp-Nott replacement mat costs less and is backed by 27 years of research and use by middle school teams all the way to the Pros. Why pay MORE for a product that the manufacturer will only stand behind for the first 90 days? 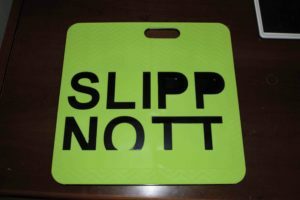 When you stock and sell Slipp-Nott products you can feel secure in knowing that your purchase will be backed by a company who has been in business for over a quarter of a century. We think the choice is clear. Buy with confidence, buy Slipp-Nott! This entry was posted in General, Slipp-Nott Tech, Uncategorized and tagged fast-brake, Step n Grip, StepnGrip, Traction mat.